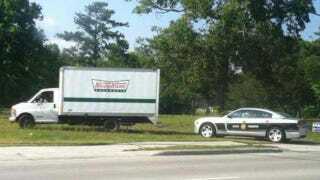 Here we see a state trooper in Eastern North Carolina pulling over a doughnut truck, thus bringing a tired stereotype to life. The local ABC news site wcti12.com posted this picture from a reader's now-deleted tweet. We do not know if the truck was performing some kind of moving violation, if the trooper was the most hilariously crooked cop we've ever seen, or if this was some sort of absurdist performance art meant to raise awareness of corruption in the government.